For me, 2015 was another year filled with great reading. I read around 90 books in 2015 (mostly older books), and only a handful turned out to be disappointing in some way. 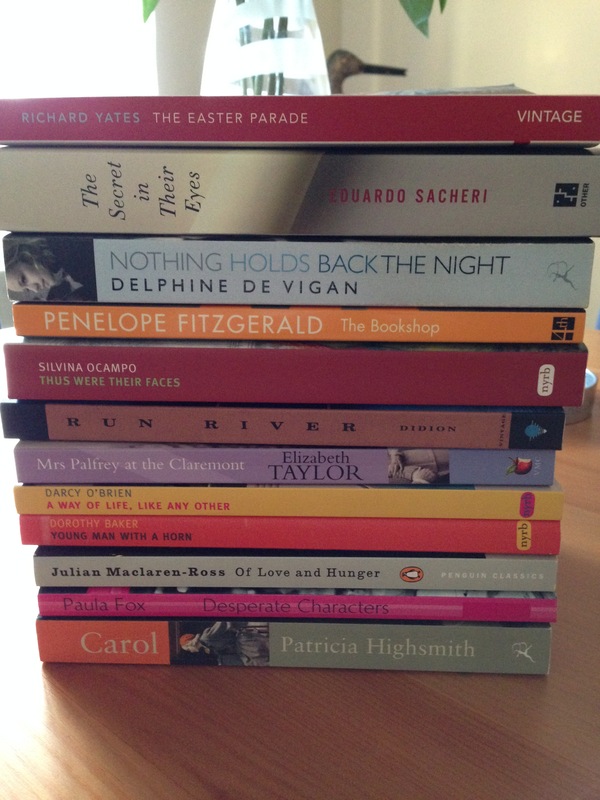 Once again I found it very difficult to finalise a shortlist for this post, but I’ve managed to whittle it down to a final thirteen: a baker’s dozen of excellent books, plus a few honourable mentions along the way! These are the books I love, the books that have stayed with me, the ones I’m most likely to revisit one day. I’ve summarised each ‘winner’ in this post, but you can click on the links should you wish to read the full reviews. Considered by some to be Yates’ best, this novel follows two sisters who take very different paths in life. Their story taps into a familiar theme in this author’s work: the search for happiness and fulfilment that always seems to elude his characters. Despite the deep sense of sadness running through the novel, this was my favourite reread of the year. A superb book (I doubt whether it gets much better than Richard Yates). Honourable Mentions (All of these are winners in their own right): After Leaving Mr Mackenzie by Jean Rhys; A Heart So White by Javier Marías; The Long Good-Bye by Raymond Chandler. Set against the backdrop of Argentina’s Dirty War, the story focuses on the bond that develops between a clerk in the Buenos Aires investigative court and the husband of a murder victim. This is a first-rate novel—part psychological mystery, part exploration of corruption in the Argentine criminal justice system, but always engrossing. To be honest, I’ve only read a couple of autobiographical books this year, but the de Vigan was so good that I had to find a slot for it somewhere! Virtually impossible to summarise in a couple of sentences, this remarkable story focuses on a woman’s quest to gain a deeper understanding of her mother following the latter’s death by suicide. A genuinely absorbing book, beautifully written – de Vigan’s prose is luminous. Poor Florence Green is up against it at every turn as she tries to open a bookshop in the (fictional) Suffolk town of Hardborough. The town is the kind of microcosm where everybody knows everybody else’s business, a place where gossip, hierarchies and class systems all play an important role. Fitzgerald writes with great insight about life’s failings and disappointments, but she is a humorous writer too – every scene is so finely observed. Of the three Fitzgerald novels I’ve read to date, this is my favourite. Honourable Mentions: Tristana by Benito Pérez Galdós; Madame de___ by Louise de Vilmorin; Agostino by Alberto Moravia. I love the stories in this edition of forty-two pieces drawn from a lifetime of Ocampo’s writing, the way they often start in the realms of normality and then tip into darker, slightly surreal territory. Several of her stories point to a devilish sense of magic in the everyday. An unusual and poetic collection of stories that blur the margins between reality and the imaginary world. Highly recommended, especially if you’re looking for something different. Honourable Mentions: Things Look Different in the Light by Medardo Fraile; Subtly Worded by Teffi. It was a tough call between this book and Didion’s iconic Play It As It Lays; in the end, Run River was the one that stood out for me. I love the melancholy tone of this novel which explores the disintegration of the relationship between a husband and wife living in California. There is a sense of things dying here: Lily and Everett’s relationship; the traditional rancher’s way of life; people die too. I can’t imagine it being set anywhere other than California. In some ways, it’s a lament for a time that has all but disappeared. One for fans of Richard Yates – there are similarities with The Easter Parade. This novel follows a recently widowed elderly lady, Mrs Palfrey, as she moves into the Claremont Hotel where she joins a group of residents in similar positions – each one is likely to remain there until a move to a nursing home or hospital can no longer be avoided. This is a beautiful, bittersweet, thought-provoking novel, one that prompts the reader to consider the emotional and physical challenges of old age: the need to participate in life, the importance of small acts of kindness, the desire to feel valued. Taylor’s observations of social situations are spot-on (there are some very funny moments). A real gem. Part compassionate satire, part touching coming-of-age story, this semi-autobiographical novel was inspired by O’Brien’s experiences of growing up in Los Angeles in the 1940s and ‘50s. The boy’s father used to be a famous actor, but his career has faded over the years. By the time he is twelve, the boy is living with his melodramatic, alcoholic mother, acting as her confidante and helping her through the bad times. This is a wonderful book – funny, sad, ironic and sympathetic. In many ways, it reminds me of early-to-mid-period Woody Allen (you know, the good ones before things went astray). Dorothy Baker makes my reading highlights for the second year running, this time with Young Man with a Horn, a novel inspired by the music of jazz legend, Bix Beiderbecke. The story focuses on the life of a fictional character named Rick Martin, a jazz musician whose passion for music is so great that he struggles to keep pace with his own ability. This is good old-fashioned storytelling strong on mood, atmosphere and the rhythm of the music. Baker’s writing is top-notch. Set in the 1940s, this novel is narrated by Richard Fanshawe, a young man who finds himself in the unenviable position of trying to eke out a living by selling vacuum cleaners to sceptical housewives. The story is shot through with dark humour, much of which stems from Maclaren-Ross’ wonderfully sharp observations on Fanshawe’s experiences as a salesman and life at the boarding house where he rents a room. Probably my favourite read of the year – a must for Patrick Hamilton fans. Set in New York in the late 1960s, this short novel follows a weekend in the lives of Sophie and Otto Bentwood, a childless upper-middle-class couple living in Brooklyn. When Sophie is bitten by a cat, the incident is the first of a number of disturbing events that threaten to destabilise the Bentwoods’ seemingly harmonious existence. This is a subtle and very effective character study; slowly but surely Fox peels away the layers to expose Sophie’s vulnerability and Otto’s failings. A novel that has grown in my mind over time. Set in Enniscorthy (the author’s birthplace), a small town in the south-east of Ireland in the late 1960s, Tóibín’s latest novel is the touching story of a woman who has to find a new way to live following the death of her husband. This is a novel that speaks to me on a personal level; so much of Nora’s story reminds me of my own mother’s experiences following the loss of my father. A subtle character study of a woman’s inner life. As one might expect with Tóibín, the sense of place is wonderful, too. Highsmith’s ‘underground’ novel centres on the development of a relationship between Therese, a young aspiring designer and Carol, an older woman in the midst of a divorce and custody battle for her child. I really love this book; it is beautiful, insightful and involving. The central characters are so well drawn – the longing Therese feels for Carol is portrayed with great subtlety. While Carol is quite different to the other Highsmith novels I’ve read, it contains moments of real tension, both sexual tension and flashes of fear and anxiety. Familiar Highsmith themes such as obsession, desire and morally complex scenarios are here, albeit in a different context. This is the source novel for Todd Haynes’ recent film, Carol – both the novel and the movie come with a high recommendation from me. Thank you to everyone who has read, shared or commented on my posts over the last year, I really do appreciate it. Wishing you all the best for the festive season and the year ahead, may they be filled with many wonderful books! This entry was posted in Book Reviews, Books of the Year and tagged 4th Estate, Alberto Moravia, Anne Marie Jackson, Benito Pérez Galdós, Bloomsbury, Boileau-Narcejac, Colm Tóibín, Daniel Balderston, Darcy O'Brien, Delphine de Vigan, Duff Cooper, Eduardo Sacheri, Elizabeth Taylor, Eric Ambler, Flamingo, George Miller, House of Stratus, Javier Marías, Jean Rhys, Joan Didion, John Cullen, Julian Maclaren-Ross, Louise de Vilmorin, Margaret Jull Costa, Medardo Fraile, Michael F. Moore, NYRB Classics, Other Press, Patricia Highsmith, Paula Fox, Penelope Fitzgerald, Penguin Books, Penguin Modern Classics, Personal, Pushkin Press, Pushkin Vertigo, Raymond Chandler, Richard Yates, Round-Ups, Silvina Ocampo, Teffi, Vintage Books, Vintage International, Virago Modern Classics on December 22, 2015 by JacquiWine. While looking through my shelves for suitable books for Women in Translation month, I found Louise de Vilmorin’s novella Madame de___. It’s a perfect one-sitting read, short enough to squeeze into a spare hour or two. Despite being published in 1951, Madame de ___reads like a classic 19th-century French novel, albeit in miniature. It is a beautifully constructed story: elegant, artful and poignant all at once. Madame de___ is a woman of some distinction. She and her husband, an astute and wealthy man, belong to a circle of society that values elegance, discretion and reputation. They are no longer in love with one another but have moved into a different phase of their marriage; nevertheless, it suits both of them to remain together. Even though her husband never questions the amount of money she spends on clothes, Madame de ___ likes to think of herself as rather clever and prudent. Consequently, she keeps the true extent of her expenditure hidden from her husband. After this has been happening for few years, Madame de ___ finds herself with significant debts to settle. Unwilling to confess her position to her husband for fear of losing either his respect or his confidence, she decides to sell some of her jewellery in secret. After some deliberation, Madame de ___ settles on a pair of earrings made of two glittering heart-shaped diamonds, a gift from her husband on the day after their wedding. “You are so charming that I am sure people always believe whatever you say,” said the jeweller, and he bought the earrings. A week later Madame de ___ claims she has lost the diamond earrings on the evening of a ball. The next day the incident is reported in the newspaper giving the impression that the earrings may have been stolen. On seeing the report, the jeweller feels he must approach M. de ___ and discreetly inform him of the true whereabouts of the earrings. M. de ___ is saddened to learn of his wife’s actions. He is shocked not only by the blatant manner of her deception at the ball but also by her insincerity. By pretending to be upset by the loss of the jewels themselves, Madame de ___ has shown herself to be somewhat disingenuous. Unbeknownst to his wife, M. de ___ buys the earrings from the jeweller and promptly gives them to his Spanish lover who is leaving Europe to live in South America. Following her arrival in her new home, this lady also finds herself with debts to pay, and so she sells the earrings given to her by M. de ___ to a local jeweller. A European diplomat then spots the earrings and buys them for their beauty. By pure chance, the diplomat, a newly-appointed Ambassador, happens to meet Madame de ___ at a formal dinner, and they are clearly attracted to one another. At first Madame de ___ is unsure of her true feelings for the Ambassador, but they maintain a flirtatious relationship over the course of several months. Finally, Madame de ___ realises she is in love with Ambassador and rushes to inform him. Delighted at this development, the Ambassador gives Madame de ___ a gift as a token of his love: a beautiful pair of diamond earrings, cut in the shape of hearts. By now we’re about one-quarter of the way through the book. It’s a short novella, so I don’t want to reveal too much more about the remainder of the plot; save to say the return of these earrings gives rise to more lies, duplicitous behaviour and heartache for more than one person in this story. Madame de ___ proved to be an excellent choice for WIT month. I was utterly captivated by this little novella; the prose is graceful and stylish, just like our initial impressions of Madame de ___ herself. Ultimately though, the story evokes an enduring sense of melancholy and solitude. I’ll finish with a quote that captures it as well as any other. As we join the scene, Madame de ___ is just coming to terms with the nature of her true feelings for the Ambassador. Max and Guy have reviewed Madame de ___, and their posts include further analysis on particular elements of the story – as always, they are well worth reading. My thanks also to Scott who recommended this novella. The Pushkin Press edition contains an excellent afterword by John Julius Norwich, son of the translator, Duff Cooper (one of Louise de Vilmorin’s lovers). It offers a fascinating insight into de Vilmorin’s life, one that adds another dimension to this fateful little tale. 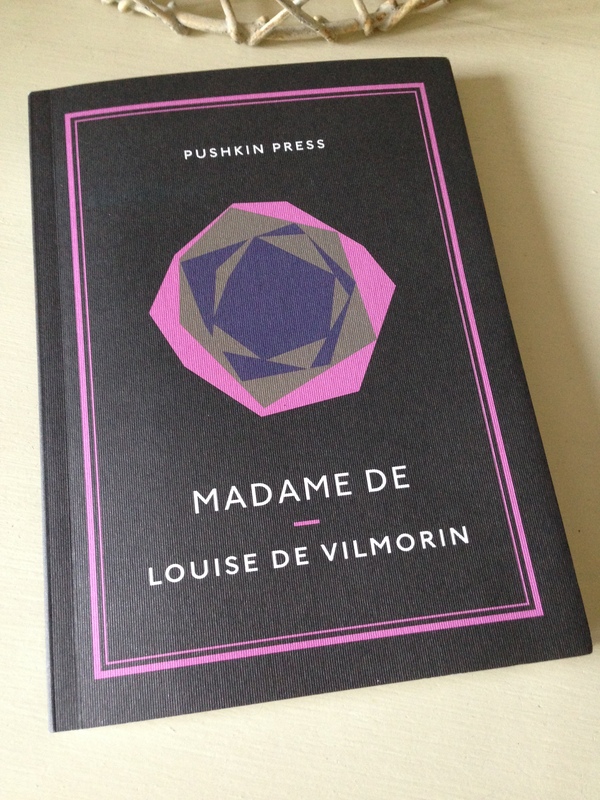 Madame de ___ is published in the UK by Pushkin Press. Source: personal copy. Book 6/20, #TBR20 round 2. This entry was posted in Book Reviews, de Vilmorin Louise, Women in Translation and tagged #ReadWomen, #TBR20, #TranslationThurs, #WITMonth, #WomeninTranslation, Book Review, Duff Cooper, Fiction, France, Literature in Translation, Louise de Vilmorin, Pushkin Press on August 11, 2015 by JacquiWine.